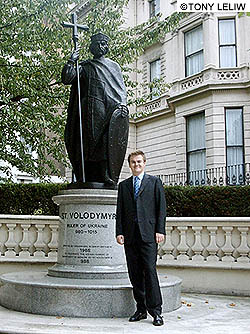 Taras Chaban, co-ordinator of Polling Stations Abroad (UK) stands by a statue of St Volodymyr, outside the Ukrainian Catholic University in London. 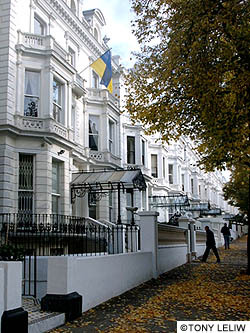 Where people will come and vote - the Ukrainian Embassy in London. 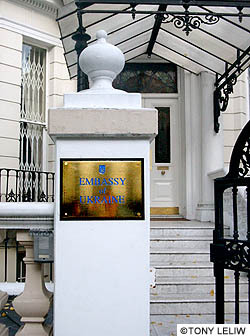 Entrance to the Embassy in London. 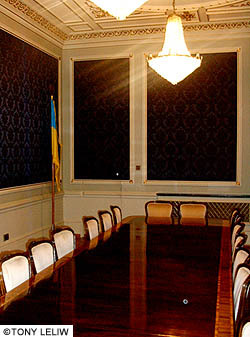 Inside the Embassy of Ukraine in London, where votes will be counted. Taras Chaban has a job on his hands. He has to convince the estimated 30,000 Ukrainians eligible to vote in Britain, to have their say in the up-coming presidential elections. Co-ordinator of Polling Stations Abroad (UK branch) Taras will also be monitoring the event to ensure it will be a good, clean, election fight - at least from this end. His trusted team of independent, unpaid volunteers, will be inside and outside of London's only polling station in Holland Park. "Of the 21 people counting the votes in the Ukrainian Embassy will be eight from our group," says the 32-year-old City banker, who harks back to Sokal, Lvivska oblast. "We will not be just relying on Embassy officials employed by the Government," he says, though he concedes that none of his people will be at the Consulate in Edinburgh, the only other polling station available in Britain. Although Polling Stations Abroad (PSA) or Zakordonnyj Vyborchyj Okruh has activists in Coventry, Birmingham and Manchester, it pains him that there are not more polling stations. "People living in the northern city of Derby might find it difficult to travel all the way to London," he says earnestly. "And the way the election rules are written you have to come twice. "First you have to make sure you are on the list of voters, so in effect you have to register yourself in person, then you have to come again and vote." Although Taras admits the PSA does not have any regulatory powers, among its members are lawyers who can tell potential voters their rights. "One misconception is that if you are an illegal immigrant - you came here legally but overstayed your visa - that stops you from voting. That is not true," he says. "It's just a question of getting registered." That message has gone out to clubs and churches and into newspapers - wherever Ukrainians can be found. The Association of Ukrainians in Great Britain, produced for them 5,000 leaflets with helplines and website information. Once the votes are counted here they will go to Kyiv to be counted again, before the Central Commission which collects all the votes from the country's polling stations has the final count. Each presidential candidate has a representative who will be present - and the votes cast in Britain will be published here as required by law. In the first round one candidate from the 25 running has to get 50%+1 vote in order to win. If this does not happen, another vote is held three weeks later on November 21, where the top two take part, and the one with the most votes wins. Taras believes that every vote will count - so the new-found 5-7 million world-wide diaspora has a role to play. From people he has been speaking to Taras is convinced that 95% of the voters in Britain will vote for Yushchenko. When he was approached recently by a BBC journalist complaining that for the sake of balance in his story he needed to find a Yanukovych voter, he advised him to call the Ukrainian Embassy. Was there any evidence that people here might be pressurised into voting for the current regime? I ask. He seriously doubted such a scenario, but if it did happen "I'd create hell", was his steely response. Taras says that politics is a slow game unless you have a revolution - though he did help events unfold a bit quicker as a student in 1990 when he joined a two-week hunger strike. The tent city hunger strikers who camped at the front of Lenin monument on October Revolution Square called on the Government to reject the union treaty with Russia and sack prime minister Vitaliy Masol. On both counts they succeeded. Taras went to Lviv Polytechnic to do a degree in Computer Science. He then completed an MPhil at Liverpool University in the same subject. He was privately financed to come here. Working and living in London's fashionable Kensington, he is often seen taking his four-year-old daughter to Ukrainian Saturday School. Regarding election predictions, Taras takes a deep breath and says that if the election is fair Yushchenko can win. As he puts it: "If Ukrainians have the strength in them to vote and stand for their votes, if the Government tries to change them, they will change the Government." Tony Leliw is a London-based journalist whose articles have appeared in respected publications such as the London Evening Standard and The Times, as well as news services in Ukraine and the U.S.